Nine to 33 million visits to the emergency room (ER) for asthma worldwide may be triggered by breathing in air polluted by ozone or fine particulate matter—pollutants that can enter the lung's deep airways, according to a study published today. "Millions of people worldwide have to go to emergency rooms for asthma attacks every year because they are breathing dirty air," said Susan C. Anenberg, Ph.D., MS, lead author of the study and an Associate Professor of Environmental and Occupational Health at the George Washington University Milken Institute School of Public Health (Milken Institute SPH). "Our findings suggest that policies aimed at cleaning up the air can reduce the global burden of asthma and improve respiratory health around the world." Approximately 95 percent of the world's population lives in places with unsafe air. 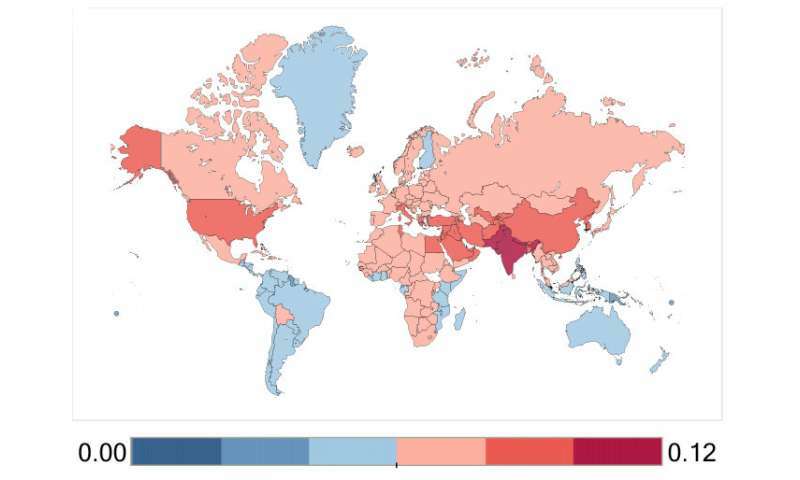 Previously, the Global Burden of Disease Study focused on quantifying the impacts of air pollution on heart disease, chronic respiratory disease, lung cancer, and lower respiratory infections—finding that fine particulate matter and ozone were associated with 4.1 million and 230,000 premature deaths in 2016, respectively. "We know that air pollution is the leading environmental health risk factor globally," Anenberg said. "Our results show that the range of global public health impacts from breathing dirty air are even more far reaching—and include millions of asthma attacks every year." More information: "Estimates of the Global Burden of Ambient PM2.5, Ozone, and NO2 on Asthma Incidence and Emergency Room Visits," appeared online October 24 in the journal Environmental Health Perspectives.